How to write a profile that does you justice and makes her want to know more. What to write in a first message to get her to respond and make her want to meet you. It's all in these eBooks. These eBooks tell you step-by-step, exactly what to write in your profile and messages... And why it's what women want. 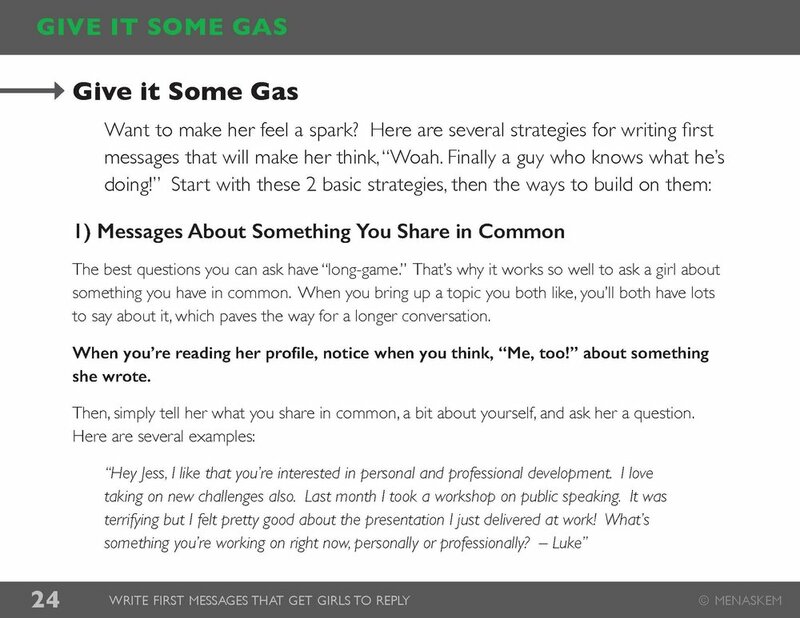 How to write your profile and great first messages. These are the ONLY strategies that really matter in online dating. Online dating gets easy when you know what girls want to read in your profile and messages. I've worked with countless guys like you to get them the results they deserve: replies, dates, girlfriends. I put 7 years of research and everything I know in these eBooks. I've studied online dating since 2010. I’ve received thousands of messages and read hundreds of profiles. I’ve researched online dating studies, articles, and census surveys. I've interviewed women and men about their best strategies, worst pet peeves, and their horror stories and happy endings. For the cost of drinks on a date, increase your odds of going on LOTS of dates. Get both eBooks for 22% off! ...And Make Her Want to Meet You! - The 13 mistakes OTHER guys make - but not YOU! Message Examples You Can Sent Today! - Why girls are ghosting on your conversation...and how to win them back! - How to find the girls who are excited to get your messages! - What to say to keep her interested! - 50 tips to stand out, initiate conversation, and make her want to meet you! ...That Write Your Entire Profile FOR You! Get 250+ EASY Tips to Make Her Want to Meet You! - 60+ pages of tools & tips designed to help you describe yourself easily, prove you're different from other guys, and do yourself justice. - 80 Questions & Prompts to EASILY WRITE each section of YOUR ENTIRE PROFILE! - 10 Profile Worksheets for each section of an OkCupid profile (easy to use for Match.com, Plenty of Fish, and more)! - 10 Simple Goals for what you REALLY need to write in each section...and WHY IT WORKS on women! - Tips for putting your answers together so your profile writes itself, easily and naturally. - 69 Great Online Dating Profile Examples from real guys! The Best Profile Picture Secrets! - 17 of the BEST & WORST Profile Pictures for YOU...and why girls love or hate them. - Why women fear the worst when a guy has only 1 or 2 profile pictures! - 8 NEW Ways to Get MORE Profile Pictures! - 4 Major Profile Mistakes other guys make -- but not you! - 3 Easy Ways to Write Better than Your Competition! - And MANY MORE online dating tips for men! Take control of your online dating results today. Get 100+ pages of easy, step-by-step instructions, smart strategies, and examples of great first messages and online dating profiles. Get both for 22% off! I started MenAskEm because I believe good guys should always get the girl. 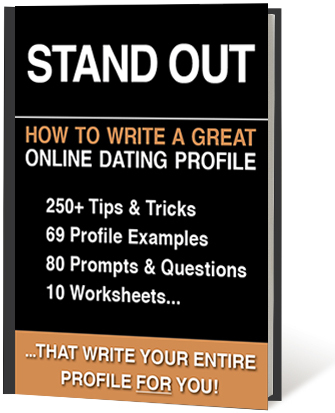 These ebooks outline exactly how to be good at online dating in simple, actionable tips. I've studied online dating since 2010. I’ve received thousands of messages and read hundreds of profiles. I’ve researched online dating studies, articles, and census surveys. I've interviewed women and men about their best strategies, worst pet peeves, and their horror stories and happy endings. I've worked with countless clients to get them the results they deserve.I know what messages women reply to, what profiles get our attention – and WHY. Plus, as the owner of a successful marketing consultancy, I know a thing or two about great writing, persuasive marketing, and crafting the right first impression. MenAskEm gives this knowledge to the good guys – the men who want to do this right. The guys who deserve to get the girl. If you’re one of the good guys, you deserve an edge.